Thousands more Rohingya Muslims are continuing to fleeing large-scale violence and persecution in Myanmar and crossing into Bangladesh where more than half a million others are already living in squalid and overcrowded camps to escape large-scale violence, according to witnesses and drone footage shot by the U.N. office for refugees. 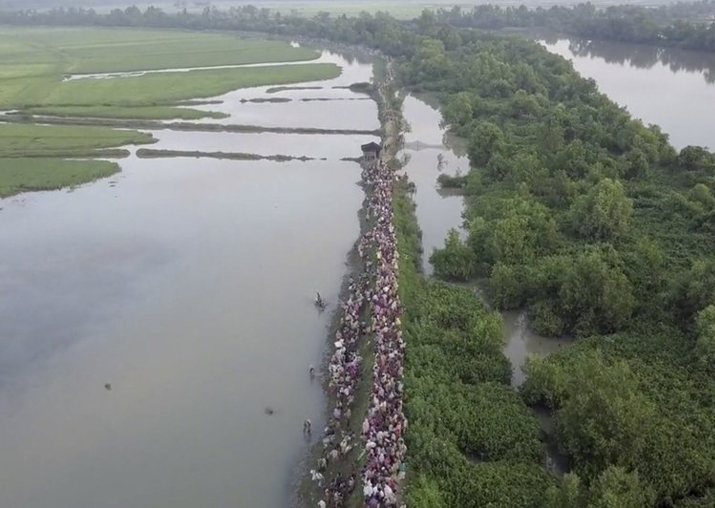 The UNHCR video shot Monday shows thousands upon thousands of Rohingya Muslims trudging along a narrow strip of land alongside what appears to a rain-swollen creek in the Palong Khali area in southern Bangladesh. The line of refugees in the footage stretches for a few kilometers. Witnesses say that a new wave of refugees started crossing the border over the weekend. An Associated Press photographer saw thousands of newcomers stretching for several kilometers near one border crossing Tuesday. Several said that they were stopped by Bangladeshi border guards and spent the night in muddy rice fields. 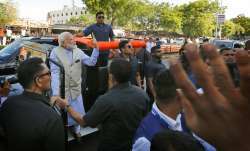 Local government administrator Mohammad Mikaruzzman said Tuesday that he heard that some 20,000 people have arrived since Sunday crossing the border on foot or by boat at several points. According to the U.N. some 537,000 Rohingya refugees have arrived in Bangladesh since violence erupted their Aug. 25. The exodus has continued, with a few small breaks, over the last eight weeks. A woman who spoke to The Associated Press on Tuesday after her arrival said they had had no food to eat. “We came here two nights ago with lot of difficulties. It took us eight days to reach here,” said Anjuma, who gave just one name. Several refugees said Bangladesh border guards were not letting them move toward the refugee camps and they were forced to spend a night out in the open in pelting rain.